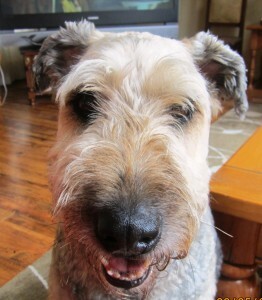 Gaston came to AireCanada from another rescue. He was in temporary foster care and had to be moved very quickly. With assistance from friends, I was able to arrange a foster situation for Gaston and he was transferred to AireCanada’s care. 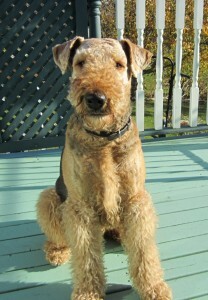 Gaston was born in Quebec and lived with his family for most of his 7 years. He was presented as having severe dog aggression but was great with people. What I didn’t know until the vet records were accessed is that, at the age of 3, he was diagnosed with a condition called Lumbosacral Syndrome. Dogs with this condition may be in pain and, from what my foster and I have observed, he is not aggressive to dogs but either fearful or hurting. When he gets excited he lunges and again we think this is more of a response to pain. Long walks are out for this boy and he does appear to let you know when he has had enough. The good news is that this condition can be managed. Both the lady who is fostering him and I would dearly love to keep him but her circumstances and mine preclude this option. He is well mannered, loves being near the wood stove, is very curious, but doesn’t like to be left alone — an issue we are addressing. I drove this boy from Dartmouth to Antigonish. He is a perfect car traveller. We stopped once on the drive. He saw dogs in cars, did a bark and then ignored them. The person or family who are fortunate enough to be selected as Gaston’s forever family must have a fenced area, should not leave him alone for hours at a time, would agree to feed him quality food, avoid further vaccinations and…love him unconditionally. Gaston deserves no less. His first vet appointment as an AireCanada boy is November 20th. I know for sure he will require dental work but will not know the full extent of what he needs until he is seen by the veterinarian. 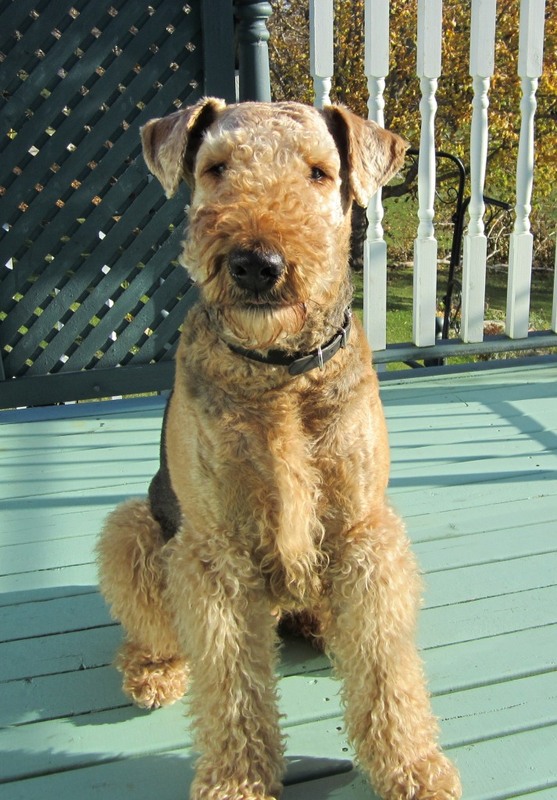 For further information regarding Gaston, please contact Maureen Tate, AireCanada Airedale Rescue Network Atlantic Canada, at divineaire@gmail.com. Will you give Jessie in Nova Scotia a home? JESSIE HAS BEEN ADOPTED! THANK YOU FOR YOUR INQUIRIES! 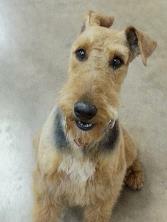 Jessie is a purebred Airedale who needs a new home. She will be a mere two years old in July. 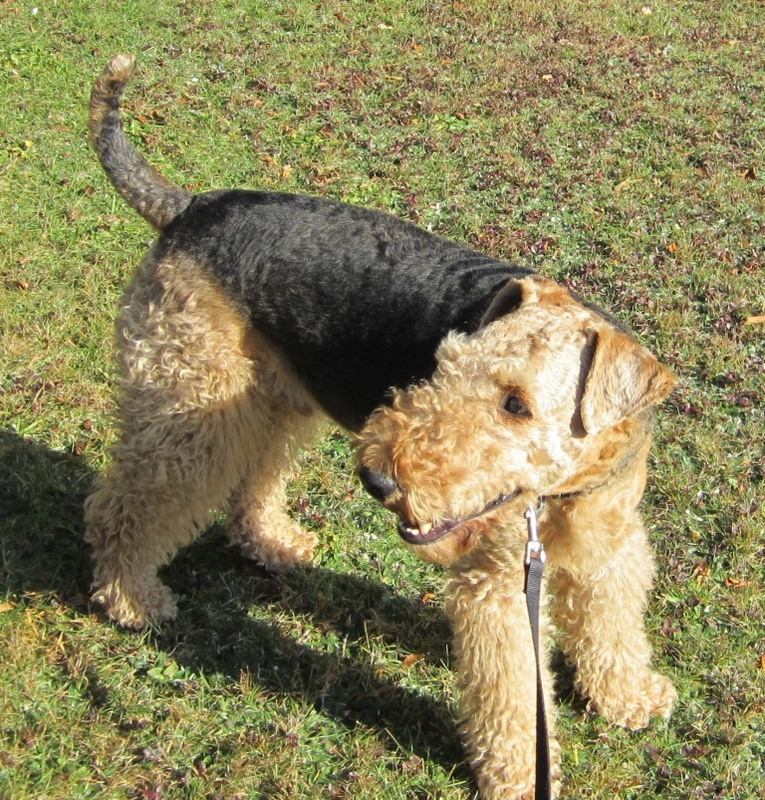 She loves being with people but, like most young Airedales, can be easily distracted by other interesting events — a dog to play with, a leaf to chase…. She is currently being kenneled and has become great friends with two male dogs, but we have yet to confirm whether she can do as well with female canine companions. 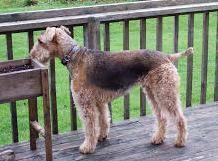 Airedales are, essentially, dogs bred to hunt small animals. Thus, Jessie has a strong prey drive. We cannot recommend her to a home which she must share with cats, rabbits, small rodents and similar creatures. A securely fenced yard is required as well. 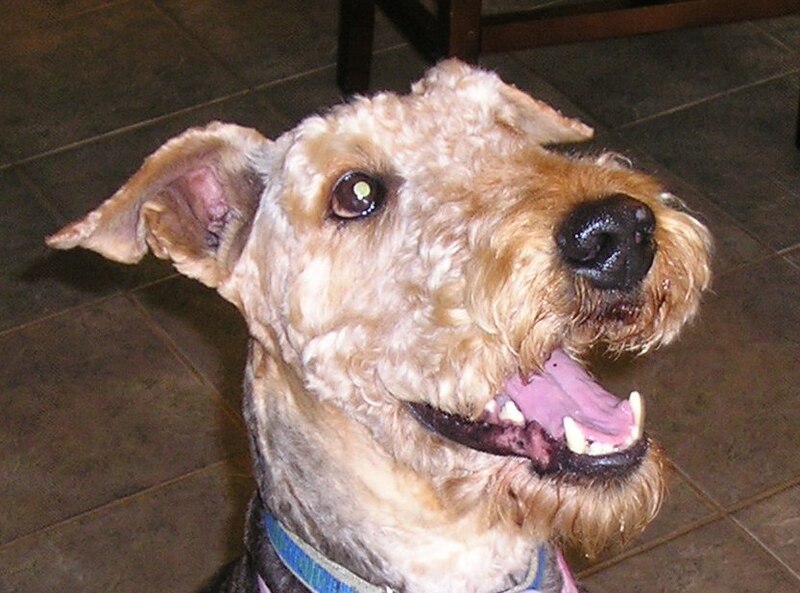 In her previous circumstances, Jessie was allowed to run free and can be described as something of a free spirit. We believe she will need lessons to teach correct leash behavior and are looking into having a trainer offer an assessment and, perhaps, some training to encourage respectful on-leash behavior. Jessie is spayed and vet checked. Her blood chemistry is good. However, she may have a minor problem with her left stifle. We are waiting to see if this may be only a slight sprain. She has been groomed and looks wonderful! Jessie has the funniest ear which sticks up. This gives her a very quizzical — and unique –appearance. Here I am! I am very handsome! 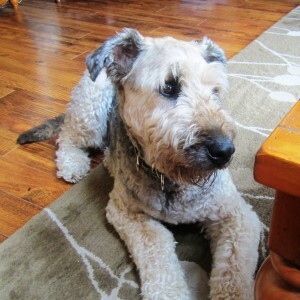 Thanks everyone, Max has been adopted. Max is a 7 ½ year old, handsome, well-mannered boy. 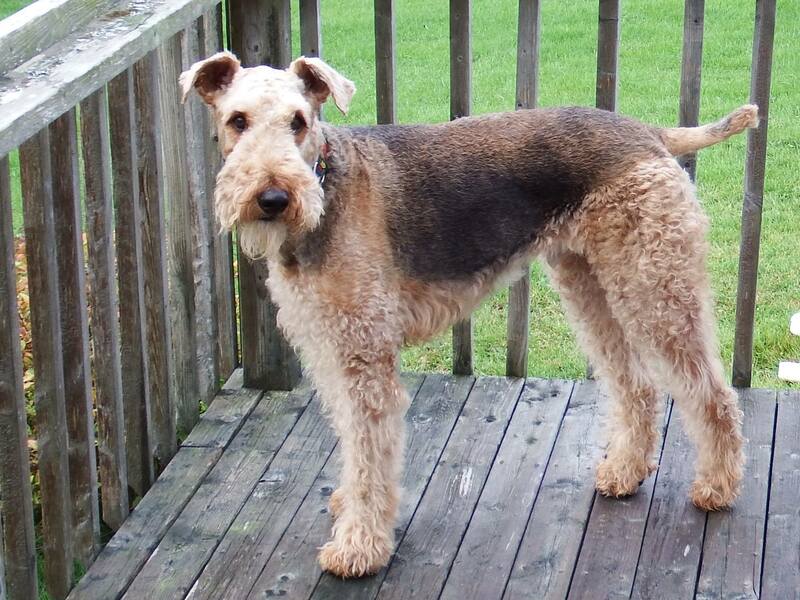 He is extremely obedient but still a typical Airedale who meets people on his own terms and with some reserve. 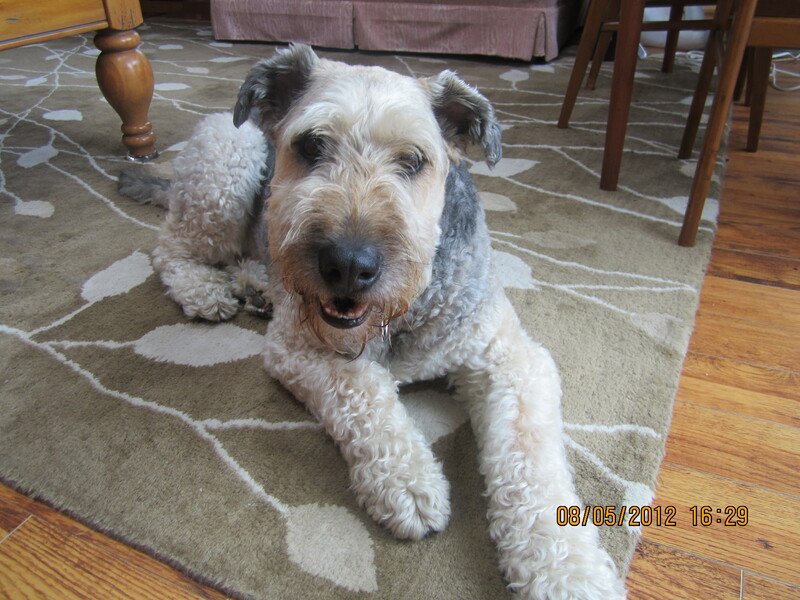 This is a very, very nice boy who does not beg for food, truly loves people and gets along fine with other dogs. I really need a new home! 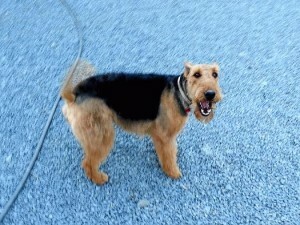 Max has lived with a cat but, being a normal Airedale, will certainly chase chance-met cats as well. Since he has had no experience with children, it is recommended that he find his forever placement in an adult only home. Max is up-to-date on vaccinations and is neutered. Max would make an excellent companion for an adult family. He would love to spend the Christmas holidays this year in his new home. Could that be yours? 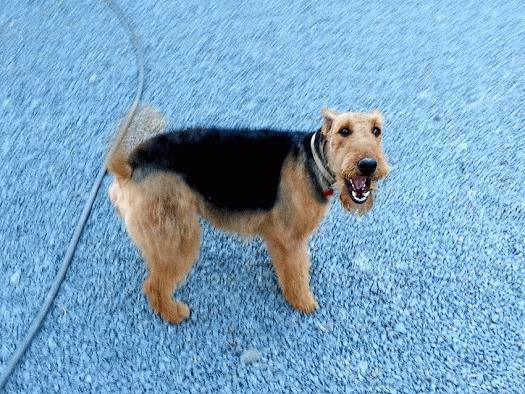 Max is in Nova Scotia. 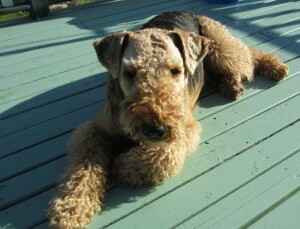 Winnie in Nova Scotia is Looking for a New Home! I Found my New Home! 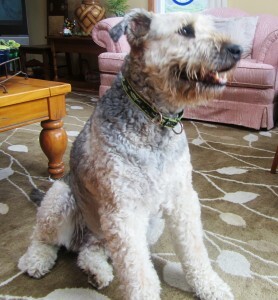 WINNIE HAS BEEN ADOPTED. THANK YOU ALL FOR YOUR INTEREST IN HER. 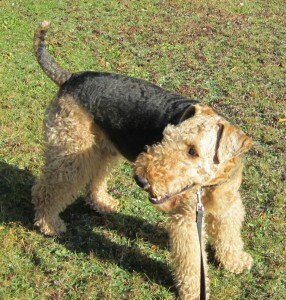 IF YOU ARE STILL LOOKING FOR AN AIREDALE IN THE MARITIME AREA, CHECK OUT BUZZ! HE URGENTLY NEEDS A NEW HOME AS WELL.